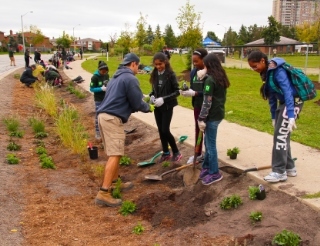 In 2014, the City of Brampton retrofitted two lined bioretention swales (also referred to as biofilter swales, bioswales or dry swales) within the road right-of-way of County Court Boulevard, a medium traffic collector road that services residential, institutional and parkland areas in the neighbourhood. County Court is the focus of a Sustainable Neighbourhood Retrofit Action Plan (SNAP), a collaborative City of Brampton, TRCA and Region of Peel led initiative to promote widespread adoption of sustainable technologies, practices and lifestyles in the community. The east and west biofilter swales are 70 and 85 metres in length, respectively, and 3 m wide. They service a combined drainage area of 3,095 square metres. Road runoff enters the swales through a series of curb cut inlets along their length. The swales feature herb and grass plantings and river stone cover, thereby creating an attractive landscaped feature that also treats road runoff. Impermeable liners were included in the design to protect the watermain infrastructure located below them from potential impacts of enhanced infiltration of de-icing salt laden stormwater during winter. Life cycle cost of total suspended solids removal over a 50 year life cycle. Stormwater treatment performance of each biofilter swale and effluent temperature was continually monitored for 16 months in parallel with an untreated portion of County Court Blvd. (i.e., control catchment). Observed suspended solids treatment performance was combined with a 50 year life cycle cost estimate, generated using the LID Life Cycle Costing Tool. Results were compared with estimates for other stormwater retrofit practices suited to roadways and infiltration constrained contexts: (i) hydrodynamic separator; and (ii) grass swale). Results showed that the biofilter swales have been effective in meeting their design objectives by reducing runoff volumes, attenuating peak flows, removing pollutants and reducing thermal loading relative to the control catchment. This study demonstrates the viability of filtration-only, lined bioretention swales as a retrofit stormwater source control practice to treat runoff from a medium-traffic road within the climatic context of the Greater Toronto Area. The understanding gained about the performance and cost-effectiveness of biofilter swales helps inform decisions regarding practices to consider as part of future road reconstruction or other linear infrastructure renewal projects.